Very aggressive peeling treating deep lines, stubborn pigmentation, acne scars and problematic issues. A triple effect peel. Possible downtime and peeling is noticeable. Must be on a 2 week glycolic/salicylic home treatment before service. Advanced Clinical Treatment can be done monthly. You leave the Spa with your peel on to be washed off the next morning. Clients will need to purchase a $32 post treatment kit. During your consultation visit we will analyze your skin to determine the appropriate chemical peel treatment. Please inform us if you are using Retin A, Accutane, Renova or differin. Please discontinue use of AHA’s Retinol or Glycolic for 3 to 7 days prior to peeling service. 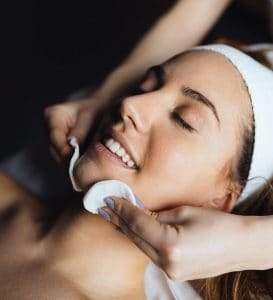 The PCA Professional Two-Step Body Peel is ideal for women and men wanting to improve the damaging effects of the sun or those who desire clearer, smoother more toned looking skin.